Avacha Bay, one of the most beautiful symbols of Kamchatka, is the peninsula’s main sea gateway (most goods here arrive by sea) and is an easy-to-reach destination for tourists. Getting to the bay takes just 10-15 minutes by taxi from Petropavlovsk-Kamchatsky. Avacha is considered one of the most picturesque bays in the world and is second only to Guanabara Bay in Brazil in terms of its dimensions. Seeing Avacha Bay from the sky is easy, even if the sky is full of clouds. Sooner or later the plane when getting ready to land in Petropavlovsk-Kamchatsky (11,876 kilometers from Moscow) will come out from under the cotton-like blanket of clouds and the bay will appear before passengers’ eyes: the immense sea forcing its way into the coast and mountains that seem to slip away into the distance is an amazing sight to behold. Beneath the plane, tiny fishing boats come into view and the proportions and huge dimensions of Kamchatka’s natural environment become evident. The Russians discovered Avacha Bay in 1703, just before the city of St. Petersburg was founded. The bay’s name has Itelmen roots and in accordance with the tradition of the times its Russian discoverers named it after the biggest river that flows into it. According to one version, the name “Avacha” comes from the Itelmen word “kshchuapach,” which means, “father-gulf.” During the Soviet period the bay was tremendously popular with tourists. Many more ships crossed it as compared to today and the fishing and trading ports in Petropavlovsk-Kamchatsky were busier. However, despite this reduction in activity, there have been some positive aspects: the ecological situation in the bay has improved in recent years, although more than 70 sunken ships of various sizes still rest on its floor. The almost 20 kilometer-long strip of land that makes up the northern coast of the bay is occupied by the regional capital, Petropavlovsk-Kamchatsky. On the other side of the bay is the so-called “wasps’ nest”: this is what NATO forces called Kamchatka’s nuclear submarine base during the Cold War. This is Russia’s main eastern outpost and the most important base of its Pacific Ocean fleet. If you’ve enjoyed a view of Avacha Bay from the plane, you have only seen part of it, and it is worth devoting some time to see it up close from a motorboat. You’ll get a privileged and detailed look at the peninsula’s coasts and you will be surprised at how small five-story buildings look when volcanoes, silent and rigid, tower over them in the background. 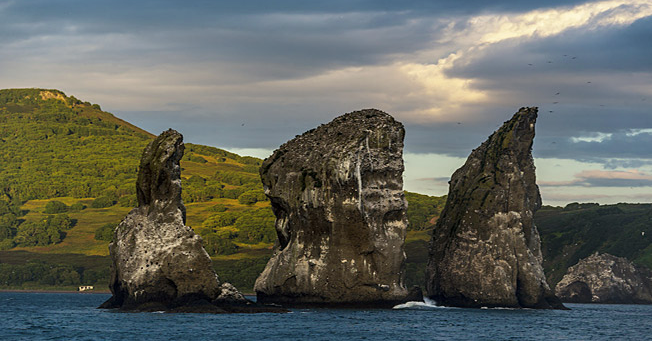 A visit to the rocks called “Tri brata” (“three brothers” in Russian) is compulsory for any visit here and is one of Kamchatka’s most recognizable symbols. Legend has it that in ancient times three handsome young men from one of the tribes living on the coast decided to defend their people from the destructiveness of ocean waves and stood up at the entrance of the bay and protected it from a tsunami with their bodies. And there they have stood ever since, greeting fishing and cargo boats, border service ships, and submarines and cruisers that enter the bay and exit it into the ocean. Diving is another possibility here. According to experienced divers, the underwater world of Kamchatka is no less interesting than the mainland, however, the water is very cold even on the hottest summer day. From July-September the average temperature of water at the surface is about 10°-15°C, while at a depth of 10 meters it is 6°-8°C. At a depth of 20 meters it is 3°-6°C. On the coast of Avacha Bay at Petropavlovsk-Kamchatsky’s city limits, you can see a unique Steller sea lion habitat. Besides Kamchatka, the only other places where sea lions love lying under the sun are the coasts of San Francisco and Sakhalin Island. In the whole world only three of these mammals’ habitats are located near a human settlement. On a fine sunny day hiking up Mishennaya or Petrovskaya hills is recommended. From there you’ll be able to take wonderful panoramic shots of the bay and the nearby volcanoes: Koriaksky, Avachinsky and Vilyuchinsky.